Since its first observation, which took place, thanks to the NASA - MESSENGER Spacecraft, during the late September of the AD 2009, the Mercurian Volcanic Vent Complex located to the North/East of Rachmaninoff Basin has rewarded us with remarkable views of its Explosive History. In fact, quite a few portions of the Vent are blanketed (---> fully covered) in a Layer of very Fine-Grained Material that is thought to be composed of Pyroclastic Particles, and when we last saw this Landform at very High Resolution, we were finally able to appreciate just how fine that Surface Texture is (better yet: appears). Note: The left (Sx)-to-right (Dx) field of view in this image is about 7,2 Km (such as approx. 4,471 miles) across; North is up. 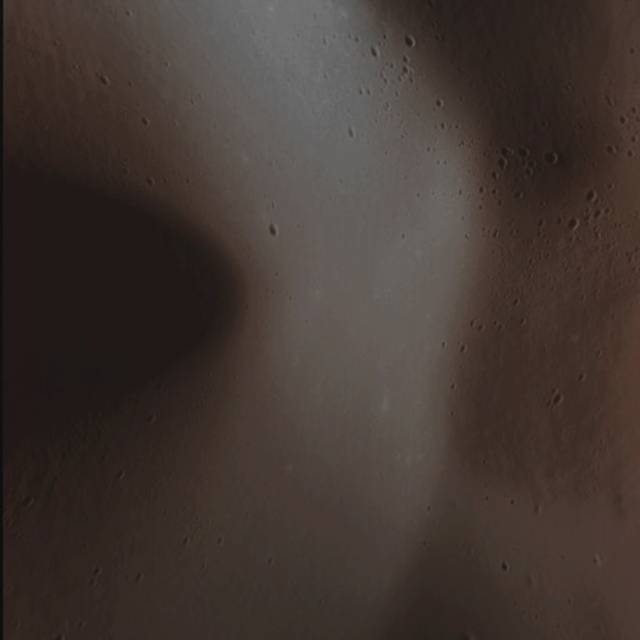 This picture (which is an Original NASA - MESSENGER Spacecraft's b/w and NON Map-Projected image published on the NASA - Planetary Photojournal with the ID n. PIA 19230) has been additionally processed, contrast enhanced, Gamma corrected, magnified to aid the visibility of the details and then colorized in Absolute Natural Colors (such as the colors that a human eye would actually perceive if someone were onboard the NASA - MESSENGER Spacecraft and then looked outside, towards the Surface of Mercury), by using an original technique created - and, in time, dramatically improved - by the Lunar Explorer Italia Team. Different colors, as well as different shades of the same color, mean, among other things, the existence of different Elements (Minerals) present on the Surface of Mercury, each having a different Albedo (---> Reflectivity) and Chemical Composition.